Midlands Surgical Consulting consists of four General Surgical and Colorectal Consultants who work closely together, both in the NHS at Heart of England NHS Foundation Trust (Solihull, Heartlands and Good Hope Hospitals) and privately. They are all highly qualified specialists with over 30 years collective consultant experience. Current surgical techniques and technologies mean that it is fast becoming more challenging for individual Consultants to offer comprehensive surgical care. The strength of collaborative working in Midlands Surgical Consulting is that each specialist has particular areas of interest, meaning that you can receive surgical assessment and management by the most appropriately skilled surgeon. 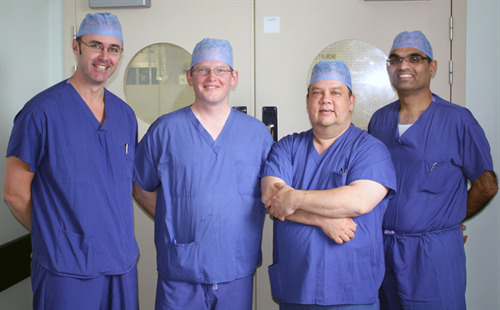 It is common that major surgical procedures have two of the Consultants working together, further enhancing patient outcome. All four Consultants are members of the Midlands Bowel Clinic .